On Monday 12th February a group of WHELF cataloguers and special collections staff gathered together in Cardiff to learn all about artists’ books – what they are and how to catalogue them. 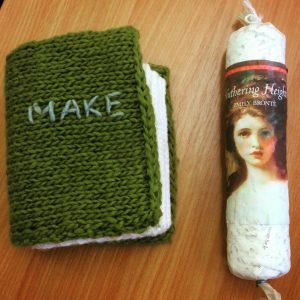 An artist’s book is a medium of artistic expression that uses the form or function of “book” as inspiration. It is the artistic initiative seen in the illustration, choice of materials, creation process, layout and design that makes it an art object. We began the day with a talk from Sarah Bodman (@SarahBodman), Senior Research Fellow at UWE, Bristol. Sarah brought a suitcase full of examples of artist’s books for everyone to handle and look at, to get a feel for the different kinds of expression these items can take. She talked us through different printing mediums and different styles of showcasing ideas, and included a brief history of artists’ books from ideas that were formulated by Stéphane Mallarmé’s Un Coup de Dés Jamais N’Abolira Le Hasard, 1897 (published 1914) which was a seminal influence on artists’ books and concrete poetry, and also Matisse’s Jazz (1947). Many key works inspire or spawn other works, such as Ed Ruscha’s Twentysix Gasoline Stations (1963), which has had many homages such as Tom Sowden’s Fortynine Coach Seats (2003) amongst others. Some artists want to engender participation from observers/readers – so, Tom Mosely has created books that he invites people to tear the paper in; and Ann Tyler included images of knives and tools which readers had to lift to read the text of Billy Rabbit: An American Adaptation (2007), thus becoming symbolically complicit in the story. 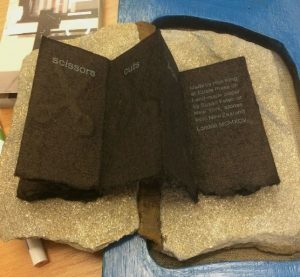 Sarah’s presentation was a great introduction to the day, and helped to show people how diverse artist’s books can be. 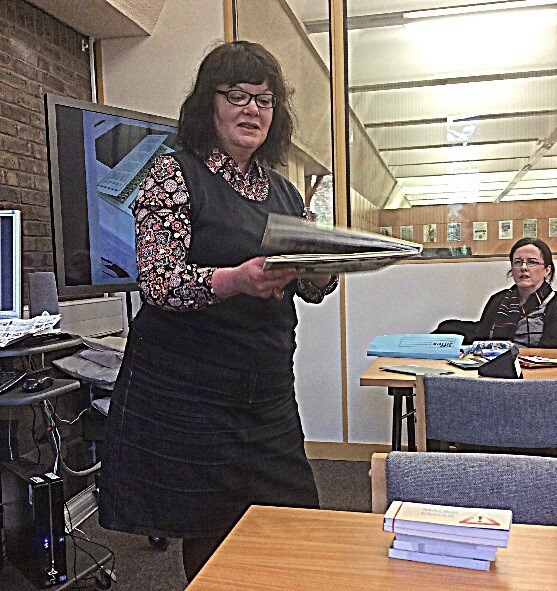 The next presentation was from Doreen Barnaville, Cardiff Metropolitan University, talking about the collection of artists’ books they have, how it came about and was built up, and how they engage their students with the books. Their collection is a working collection and students are encouraged to handle the books, and take part in workshops. Some of the books in their collection they have had for years and used to be housed in the main library collection before anyone really realised what they were, and how special they were. They now have an active collecting policy, and add to their collection each year. Those doing the buying try to get as much information from the artists themselves where possible, which can be added to the catalogue record. 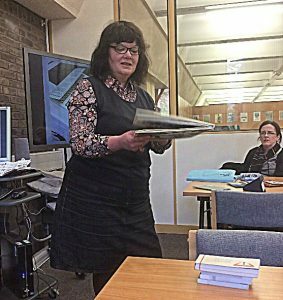 Alison Harvey (@AlisonHarvey_), Cardiff University, then spoke about Ron King and the Circle Press collection housed in CU. The collection was gained due to collaborative work between CU and Cardiff Met, as Ron King was very particular about where he wanted his works to be housed. 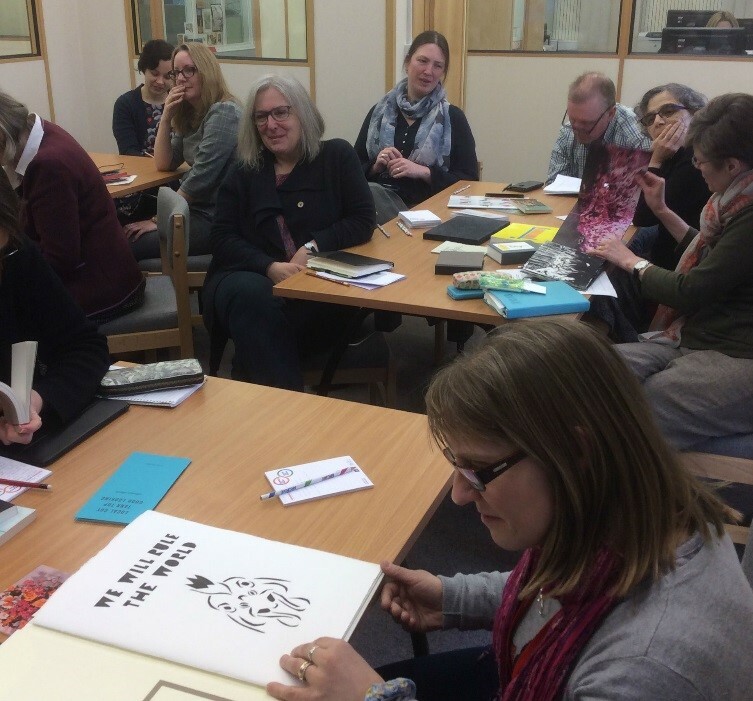 One of the first projects to take place was an exhibition held in CU Special Collections that was curated and set up by art students from Cardiff Met. Following on from this was a presentation about Shirley Jones and the Red Hen Press. Shirley Jones is a Welsh artist and several institutions in Wales house her work. Kristine Chapman (National Museum Wales) spoke about their collection that has been built up over the years since about 1999, and the relationship they have engendered with her; In contrast, Lisa Tallis (Cardiff University) then spoke about the complete set of work that Shirley had donated to CU as an alumni, including proof copies of some of her books. These proofs were brought out for attendees to peruse, and to be able to see the various stages that Shirley goes through when creating her art. After lunch we reconvened to get ‘technical’. Maria White (co-author of “Artists’ books: a cataloguers manual” ARLIS guide) spent the afternoon giving us guidance on how to actually catalogue artists’ books. After having spent the morning hearing about these items, and seeing physical examples, we had a good idea of how difficult cataloguing them might be! Maria talked us through all the relevant MARC 21 fields, and gave some suggestions of where to find further information that we might need, for example from exhibition catalogues, and artist’s and publisher’s websites. Key problems that might be encountered were – not knowing the name of the artist, not having a title for the work, and having the work in a form difficult to describe. If you are very lucky there might be an ISBN but this is unlikely if the artist has published it themselves. Maria did say that most artists would be very happy if you contacted them to get more information about the work. For a start you would be informing them that their work was held in your library, and they might find that information valuable and informative. It is also important for the person buying the work (which probably wouldn’t be the cataloguer), to get as much information as they can at the point of purchase, this is most easy if the purchase is at a book fair where you are likely to be buying directly from the artist themselves, rather than through a specialist book shop. Picking up associated ephemera, to include with the book, and even taking notes from a conversation with the artist can be extremely helpful to the cataloguing process. Maria had also brought along a load of examples, and after her initial presentation we were all given a couple of these examples to have a go at cataloguing (using paper templates). As we were sat in small groups around tables we were able to discuss the items in our groups which helped us as we put together our catalogue records. Maria said she found it very interesting listening to all the discussions, and hearing the issues and thoughts that were being generated. There were a whole range of different books to work on, and some were swapped between groups. Some were easier than others, and some needed a bit of input from Maria. After we had all completed several records (or at least discussed several items), the discussion and feedback was opened up to the whole group and we were given the ‘answer’ sheet – i.e. MARC records of all the examples, that Maria had created. The groups took turns at discussing individual items, highlighting any problems they had, or anything they found interesting. It was extremely valuable being able to see what the record for a book could look like after having a go oneself. By not using computers we had mostly not been able to check on websites for further information, although a couple of people had used personal devices to do so. It was evident that sometimes you really have to go outside the item to get basic details, such as the title –which is a very different approach to when cataloguing mainstream textbooks. The whole day proved to be very interesting, informative, and even challenging at times, but it was wonderful to be able to handle the books that both Sarah and Maria brought with them, and which brought the session to life. Colleagues from different WHELF Institutions were able to share information about their collections and how they are working with them. As there were some spare places we were joined by library staff from Bristol, Canterbury and Cork which also widened our discussions. Many thanks to WHELF (@WHELFed) for sponsoring this event, and for Cardiff University Special Collections (@CUSpecialColls) for hosting it.